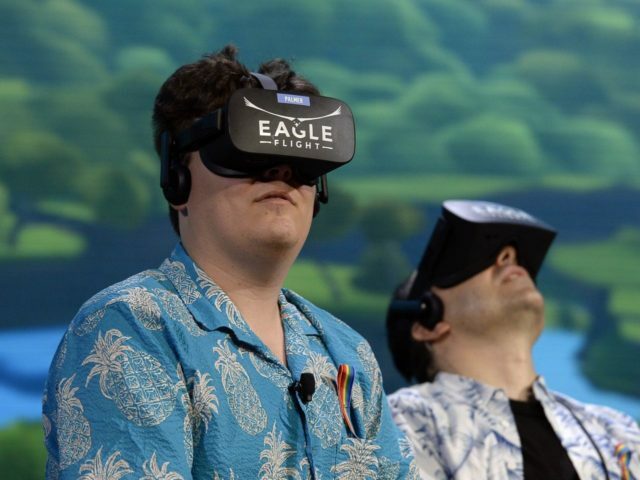 Oculus Rift creator Palmer Luckey has left Facebook and Oculus six months after his support for an anti-Hillary Clinton organization during the 2016 presidential election was revealed. As reported by Wired, “At the tender age of 19, Luckey created what would become the Oculus Rift headset, posted it to Kickstarter and raised $2.4 million (£1.93m), became a millionaire, and then dropped out of college to go full-time at Oculus.” Luckey went on to sell his product to Facebook for $2 billion. Though Luckey self-identified as a Gary Johnson-supporting libertarian following the controversy, he was repeatedly attacked by the mainstream media and Silicon Valley establishment for his political views, most notably by Gawker’s William Turton, who harassed Luckey by stalking his activity for 117 days before giving up. Following the controversy, and after Gizmodo harassed Luckey’s non-famous girlfriend in a hit piece that delved into her private life, personal Instagram pictures, and exposed her political views, Luckey withdrew from social media. He has not posted to Twitter since September 2016. The reasons behind Luckey’s departure from Oculus and Facebook are currently unknown.